I have always been a seasonal cook and enjoy the transitions of the seasons. We grow our own vegetables here at the cottage, which allows us to have either fresh,home canned or frozen vegetables available the year round. What we don't have available here, we usually find at one of our local farmers market. Some of the quesitons that I get from readers are "what is in season right now, and how can I use it?" As a way to address these questions, I will be presenting a new post every month, that will give you some of our favorite seasonal recipes for that month. Please leave us a commit and let us know if you like this idea and also if you have any other question that we can help you with. These are some of our favorite recipes that we make during this season. You will see some of them on our weekly meal plan that is included in Whats For Dinner Next Week that is posted each Saturday. 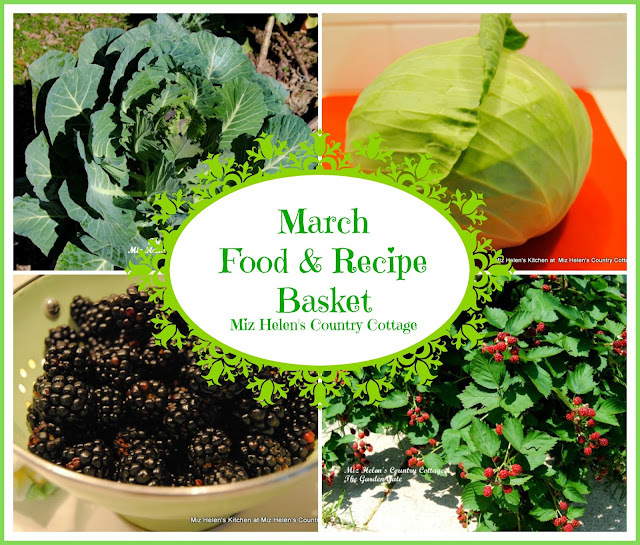 Be sure and let me know some of the food's that are in your March Food Basket. Hope you have a fantastic week and come back to see us real soon! Thanks so much Lynn, I am really looking forward to doing these post once a month. Hope you enjoy the coleslaw! Have a great week and thanks for stopping by! Fabulous Miz Helen, you know I love this! My husband was asking me the other day, how do you know what's in season? Ha, a farmer he is NOT! Great idea! Thanks so much Jenna, I am very excited about doing these post and sure hope that they will be helpful. Hope you are having a great week and thanks for stopping by! I think this is a great idea, Miz Helen! Thanks so much for stopping by and your kind comment. Hope you are having a great week Kitty! Oh man it all looks delicious! Thanks for sharing on the What's for Dinner link up! Thanks so much for stopping by, I just love you awesome party! Hope you are having a great week! Growing up my dad had a huge blackberry bush in front of our house. It produced so much fruit. I never realized what a treasure this was when you look at the price of blackberries in the grocery store. I so wish I had that bush now. Thanks so much for stopping by and sharing your comment with us. We just love our blackberry bushes and like you when we see the prices for the berries in the market, we sure are grateful for our bushes! Hope you are having a great week! These are some delicious recipes. I love cabbage is so yummy. Thank you for sharing at Dishing it and Digging it link party. We love having you share.